As mission-driven lenders, community development financial institutions (CDFIs) are serving neighborhoods the financial sector has historically neglected, but there are also many places they aren’t yet reaching, according to a massive new data set compiled by researchers at the Urban Institute. The data cover 2011 through 2015, and track 214,490 loans made by CDFIs totaling $34.3 billion — that’s $6.8 billion a year on average. The D.C.-based think tank’s work provides the clearest picture yet of the CDFI industry. It’s an industry that has grown immensely over the past 20 years. In 1997, there were 196 CDFIs with $4 billion in assets. Currently, there are 1,031 CDFIs with $136 billion in assets in all 50 states plus Washington, D.C., Puerto Rico and Guam. Combining data from public and private sources, Urban Institute researchers found that 64 percent of CDFI lending went to census tracts that had at least one of the following characteristics: an unemployment rate of 10 percent or higher, a poverty rate of 20 percent or higher, 50 percent or more residents earning less than 200 percent of the federal poverty level, or a population with at least half nonwhite residents. The findings are consistent with the U.S. Treasury’s requirement that at least 60 percent of lending must go to historically underserved areas in order to gain federal certification as a CDFI. Most CDFIs are nonprofits. Certification carries benefits such as access to funding from the U.S. Treasury’s CDFI Fund, as well as favorable status with banks or foundations that have grown accustomed to working with CDFIs to increase access to capital for affordable housing, small businesses, economic development, community facilities, and consumer lending. And yet, Urban Institute researchers also found that CDFI activity was not distributed equally across the U.S. Some counties attracted more CDFI activity than others, even when accounting for differences in population and poverty. Half of all counties across the U.S. saw less than $7 in CDFI lending annually per person living at or below 200 percent of the federal poverty line. On the other hand, 10 percent of counties saw $114 in CDFI lending annually per person living at or below that threshold. The CDFI Fund itself is making a point to share more data about the industry, including the release on Monday of data on the New Markets Tax Credit program. The CDFI Fund has made 1,032 New Markets Tax Credit awards total, and allocated $50.5 billion in tax credit authority to 345 awardees, including many CDFIs. For the first time, Monday’s release includes data showing the types of businesses that have received New Markets Tax Credit financing: From 2003 to 2015, single- and mixed-use real estate development accounted for the highest share of transactions, totaling $12.2 billion, followed by healthcare and social services with $7.8 billion, manufacturing with $4.7 billion, and education with $4 billion. 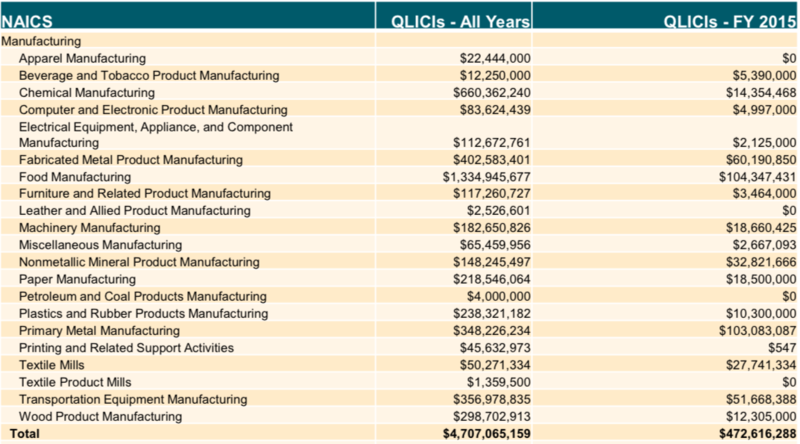 The data even drilled down more specifically into different sectors, such as manufacturing. Lastly, the CDFI Fund included maps showing county by county the amount of NMTC investment per low-income community resident. The new CDFI Fund data release complements another review of the program released earlier this year (which Next City covered), showing that the most distressed areas were the most likely to receive New Markets Tax Credit investment. All the new data and findings arrive at a key week for the CDFI industry, as many CDFI leaders and staff are gathered in Washington, D.C., for the annual gathering of the Opportunity Finance Network (OFN), a national trade organization for CDFIs. The CDFI Fund plans to discuss how to expand the geographic footprint of the CDFI industry with OFN members during the gathering. Ahead of the OFN gathering, the Urban Institute convened a number of CDFIs and their supporters from the banking industry and Congress to discuss how some have experienced expansion into new areas, while others have had success by deepening commitments to areas that remain underinvested. Grace Fricks, founder and president of Access to Capital for Entrepreneurs (ACE), explained how the organization got its start in rural Georgia, before expanding into the Atlanta metropolitan area, where it now does 80 percent of its business. It was a shift both in geography as well as race and ethnicity, from mostly white rural small business owners to mostly black small business owners in Atlanta (without losing their commitment to rural markets). This week, ACE is launching a new strategy to focus on Hispanic entrepreneurs, focused on Gwinnett County in the Atlanta metro area. Chicago Community Loan Fund (CCLF) has grown by deepening its commitment to undercapitalized neighborhoods in the Chicago area.